Not that I don't have a million other projects to work on, but I got restless the other night and did something I haven't done since 2005. I made a table file. 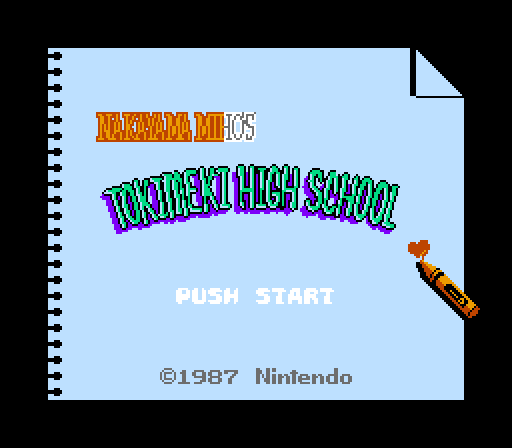 More specifically, I fired up a tile editor and messed around with a couple roms I'm interested in, Nakayama Miho no Tokimeki Gakuen being the one that I was able to find the font for, not to mention the title graphics. I've since made a seemingly complete table file, (manually) located the text for menus, ending, and dialog, and translated a couple blocks of the main script. The text encoding totally doesn't follow the order of the font, so that took a little trial and error. The game does some interesting things like using 01 as a switch in the text engine to enable or disable katakana display. It's also got the usual diacritical marks separate from the characters that use them which is typical for 8 bit stuff. 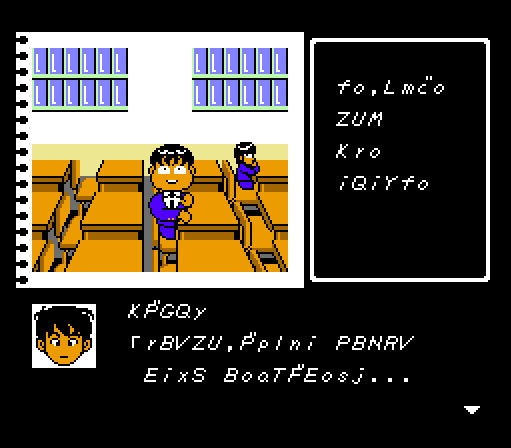 It also uses a bunch of, I don't know, single byte entries for words and partial words. Whatever you want to call that. The bummer is, that it doesn't seem to use the exact same encoding for all text with the ending, and maybe the messages using some bytes to represent different stuff than the regular dialog. Anyway, for now I have a question. Since it's been at least over a decade since I did any graphics editing, how can you copy paste graphics into something like YY-CHR? 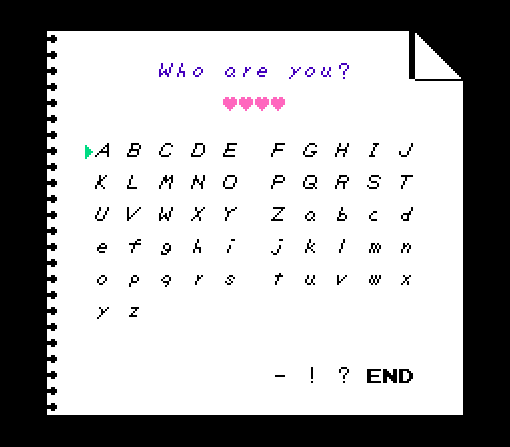 I know I've added fonts to games before, and I swear I didn't sit in the editor and recreate them with the pencil tool. No ideal what I used to do though. This game's creator pedigree is really impressive. A lot of big names were involved in this game, which is what initi a lly drew me to it. Anyhow, the game uses dictionary compression, which is the term you're looking for. I don't really use yy-chr, but there should be like a paste option. The big concern with the FDS are the space limitations of the disk. I did look at the disk utilization for the game and it doesn't utilize all the disk space. So that'll help a little bit. When it comes to it, I'm planning to ask someone to give me a hand with doing the actual script insertion. Would it help to use the dictionary compression (thanks Pennywise) that's already implemented? Though I guess it would have to be remapped to the right font graphics. 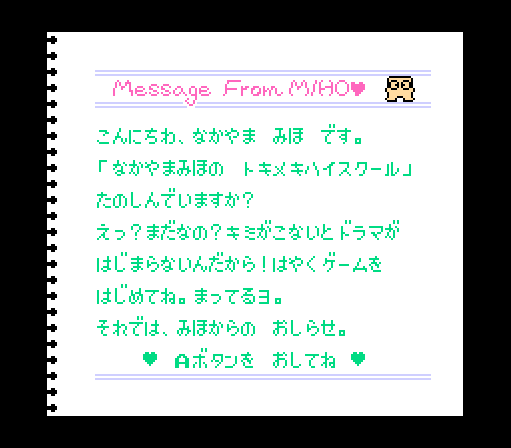 I'm glad that this game may be being translated into English due to its considerable pedigree, and the unusual way in which the player back then could contact a phone service over the FDS network to hear voice recordings from an actress for story and tips! This wiki page actually has transcripts of those voice recordings, but they're in Japanese. Perhaps you could actually edit it over there and upload your English translation? The phone numbers were cut off soon after the game's release and will never work again, so there goes that. 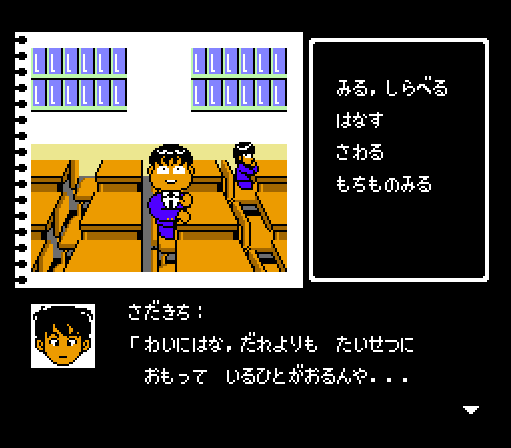 However, the messages and hints are displayed in text form in subsequent versions of the game. I don't really use yy-chr, but there should be like a paste option. Thanks, that helped. I thought maybe there was something special, but it just uses the OS clip board. Here's a title screen. Obviously the pallet will need to be changed for that one spot. Don't get your hopes up too high regarding the pedigree. It seems like a cute, interesting game, but it was probably more like a publicity stunt back then. Expect much idol nerd wish fulfillment. I heard the same thing about "later versions of the game", but where are the later versions? I'll see what I can do. You can reoptimize the compression for the English translation, but you're still gonna run into some pretty severe space limitations. I'll give you an example for what I did/am doing with Dead Zone. So the game uses dictionary compression as well in that each entry is a fixed 8 bytes, but I improved it. I increased the number of entries and recoded the dictionary to load any length I want. Using Table Dumper Pro, I split all the fds files and got a disk space and ram usage analysis, which I then used to expand a file to give me more space. Anyhow, the script's not fully translated yet and the compression isn't optimized, but I'm pretty sure the script will have to be carefully edited down to fit back in. Thanks. Though, fortunately, I've never said that this game was 'great' in its subjective term, , haha! But perhaps see it as a beginner's sort of game development, 'testing the waters', for these developers before they each went on to make better and more famous games! Well, I found this in the third paragraph in this strategy wiki article for this game but they've never referenced it to anywhere. All right font nazis, here's your chance. Here's what the text looks like. Please leave your votes below. I like Font 4 the most for readability. Font 3 is better than Font 5. Font 2 is pretty. Font 2 I'm guessing is the Link's Awakening font (or very similar). Perhaps is the most fitting. If we are to be "dreaming" of dating a popstar. So, I go with 2 first choice, 4 second. 1 is my least favorite of the options. Please don't use the Pokemon font. I also vote for 2, then 4. Lol, I didn't even notice it was Pokémon. These are mostly from an 8x8 font pack. EDIT: As it seems to be the current fav, here's the moonspeak for font 2. Here's the name entry screen. Please font 4. please please please. Interestingly, ASCII capital letters (41-5A) are available so I'm using those for menu items and "system" messages, reserving the fancy font for dialog related stuff. I don't see the font in the ROM though. Does anyone know if there is some FDS system font that this is using? I've manually inserted the menu actions. EDIT: BTW: Thanks for the additional font votes! The font is relatively easy to update so I'll take future votes into consideration (within reason). If the game itself never replaces them in VRAM, then yes they would be leftover from the BIOS startup. Ah yes, that's it! I opened the bios and there's the font plain as day. Thanks for clearing up that little mystery. So I'm finished with the first draft of the scrip. Yay! Now it's time to spot-check, and edit. After observing the recent Legend of Zelda FDS project, and reading the warnings from Pennywise and KingMike, I'm hoping this project isn't hobbled by overly restrictive space constraints. The most important thing to me is that a script is accurate and flows well. While I don't want to sacrifice either of those things, I plan to edit with space in mind. Maybe there will be a miracle and it can fit without seeing the chopping block. Who would like to help me insert this script? As has been mentioned, the fact that this is an FDS game poses some unique challenges. I've edited the script with size in mind, but it's still going to need to accommodate a larger script than it has now. Feel free to respond here or via PM. As I haven't had any responses for a couple of days, I'd like to throw the resources out there for folks to look at if you're interested. Doing one better, I've also licensed this work so that others can use it as they see fit, for a non-English translation patch for instance. At this point I'm interested in being involved in the final production of an English language patch (though it's not strictly necessary per the license), so please feel free to contact me if you'd like to work on this after reviewing the materials.